The result is this book, a riveting collection of case histories detailing the astonishing progress of people whose conditions had long been dismissed as hopeless. We see a woman born with half a brain that rewired itself to work as a whole, a woman labeled retarded who cured her deficits with brain exercises and now cures those of others, blind people learning to see, learning disorders cured, IQs raised, aging brains rejuvenated, painful phantom limbs erased, stroke patients recovering their faculties, children with cerebral palsy learning to move more gracefully, entrenched depression and anxiety disappearing, and lifelong character traits altered. 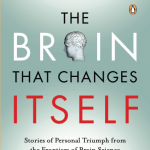 We learn that our thoughts can switch our genes on and off, altering our brain anatomy. Scientists have developed machines that can follow these physical changes in order to read people’s thoughts, allowing the paralyzed to control computers and electronics just by thinking. We learn how people of average intelligence can, with brain exercises, improve their cognition and perception in order to become savant calculators, develop muscle strength, or learn to play a musical instrument, simply by imagining doing so. 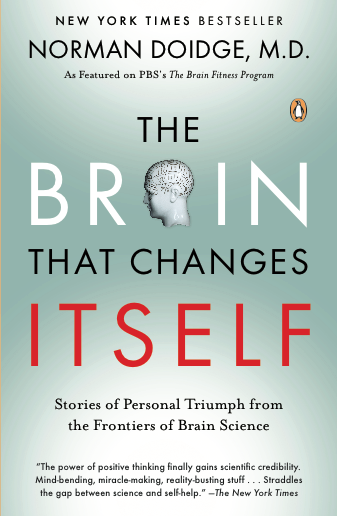 Using personal stories from the heart of this neuroplasticity revolution, Dr. Doidge explores the profound implications of the changing brain for understanding the mysteries of love, sexual attraction, taste, culture and education in an immensely moving, inspiring book that will permanently alter the way we look at human possibility and human nature.